Art Books are Fun, Now Go Play! One of the most fascinating (and fun) books in the Museum’s rare book collection is a set of books by the artist Victor Vasarely. 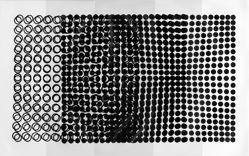 Vasarely’s four-volume set Plastic Arts (1970), which features numerous color plates, foldouts and loose plastic overlays, not only exemplifies his unique approach to art, but equips the viewer with a finite set of colors and forms to play with and manipulate. Hailed as the co-founder of optical art, or Op Art, the Abstract Painter Victor Vasarely (French, b. Hungary, 1908-1997) produced vibrant optical illusions through the manipulation of color, line, and shape. Inspired by the psychology of perception, Vasarely employed his training in graphic art and typographic design to develop a precise palette of colors and forms as a guide to the systematic organization of space on a flat surface. From this strict palette of colors and forms, his assistants produced an endless variation of dazzling, shifting, and sometimes flickering optical illusions. 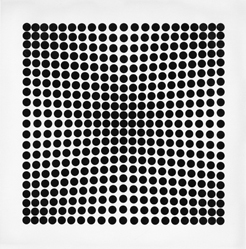 By empowering the viewer to create their own optical illusions (and to enjoy the process of doing so), Vasarely proved a significant influence on contemporary graphic and popular arts. You can find this book, and many more, in the Museum’s Library/Archives. Heather Winter manages and oversees the Museum’s George Peckham Miller Art Research Library, the institutional archives and the rare books collection. 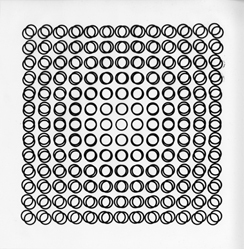 This entry was posted in Art, Library/Archives and tagged Art Books, Artist Books, Op Art, Optical Art, Optical Illusion, Victor Vasarely. Bookmark the permalink.